George Takei is an American actor, best known for his role in the television series Star Trek, in which he played Hikaru Sulu, helmsman of the USS Enterprise. He is a proponent of gay rights and active in state and local politics as well as continuing his acting career. He has won several awards and accolades in his work on human rights and Japanese American relations, including his work with the Japanese American National Museum. Takei was born George Hosato Takei in Los Angeles, California, the son of Fumiko Emily (née Nakamura) and Takekuma Norman Takei, who worked in real estate. His parents were Japanese American. His father was an Anglophile, and named him George after George VI of the United Kingdom, whose coronation took place in 1937. In 1942, the Takei family was originally housed in the horse stables of Santa Anita Park before being sent to the Rohwer War Relocation Center for internment in Arkansas. The family was later transferred to the Tule Lake War Relocation Center in California. Despite this experience, the family developed a renewed dedication and remained involved in the American democratic process. He and his family returned to Los Angeles at the end of World War II. He attended Mount Vernon Junior High School, where he served as student body president, and Los Angeles High School. He was a member of Boy Scout Troop 379 of the Koyasan Buddhist Temple. Upon graduation from high school Takei then enrolled in the University of California, Berkeley where he studied architecture. Later he attended the University of California, Los Angeles, where he received a bachelor of arts in theater in 1960 and a master of arts in theater in 1964. He attended the Shakespeare Institute at Stratford-upon-Avon in England, and Sophia University in Tokyo, Japan. In Hollywood, he studied acting at the Desilu Workshop. Takei is fluent in English, Japanese and Spanish. 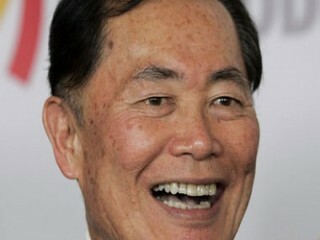 View the full website biography of George Takei.